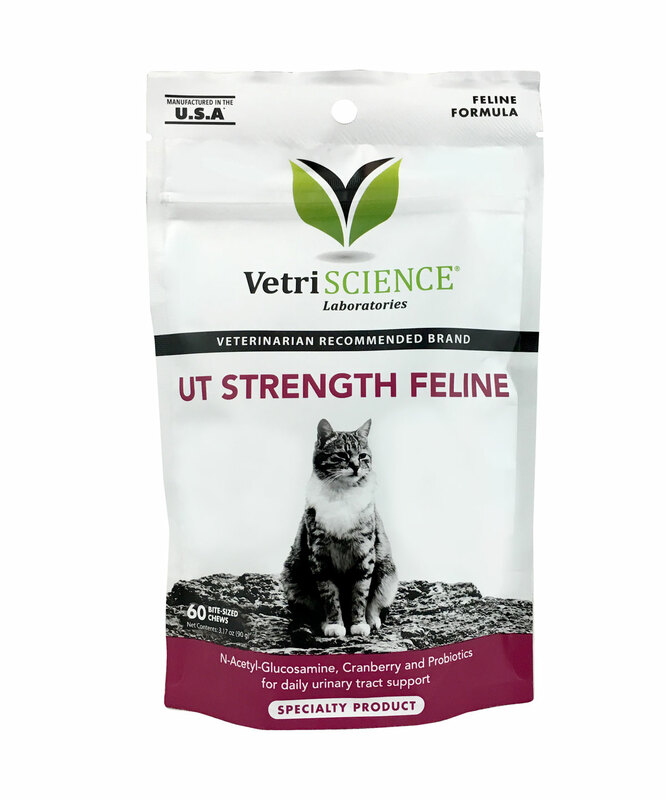 VetriScience® Laboratories’ UT Strength Feline can be used long term for those cats that are prone to urinary tract issues or crystals. UT Strength contains D-Mannose, a naturally occurring simple sugar that removes harmful bacteria by attachment and voiding. It’s absorbed eight times slower than glucose and is not converted to glycogen or stored in the liver when ingested. Rather, D-Mannose goes directly into the blood stream from the kidneys to the bladder. The bacteria displaced by D-Mannose are responsible for 80 to 90 percent of UTIs. Antibiotic treatment may cause an imbalance in the normal flora. UT Strength Feline also features N-acetyl glucosamine or NAG, an important form of glucosamine found in the body. It is the form that is used for the production of glycoproteins. The glycoprotein layer in the mucosal lining of the urinary tract has a high content of NAG. This layer of mucosal cells is the protective barrier against acids and bacteria. Inactive Ingredients: brewers yeast, calcium sulfate, chicken liver flavor, citric acid, dried skim milk, glycerin, maltodextrin, mixed tocopherols, propionic acid, rosemary extract, safflower oil, silicon dioxide, sodium alginate, soy lecithin, vegetable oil.